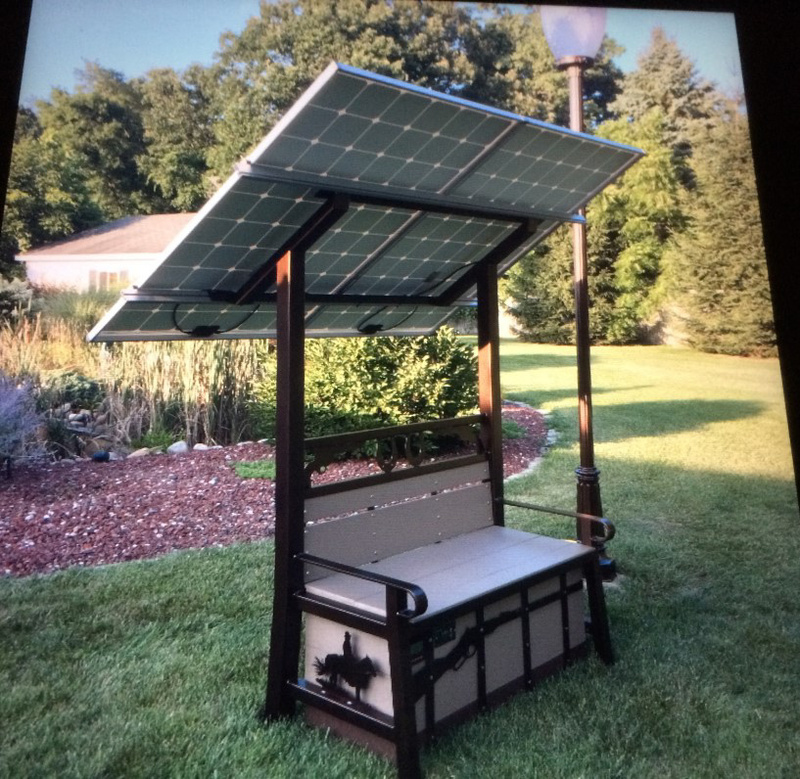 Relax with a Solar Bench and know you are secure with a backup power source. 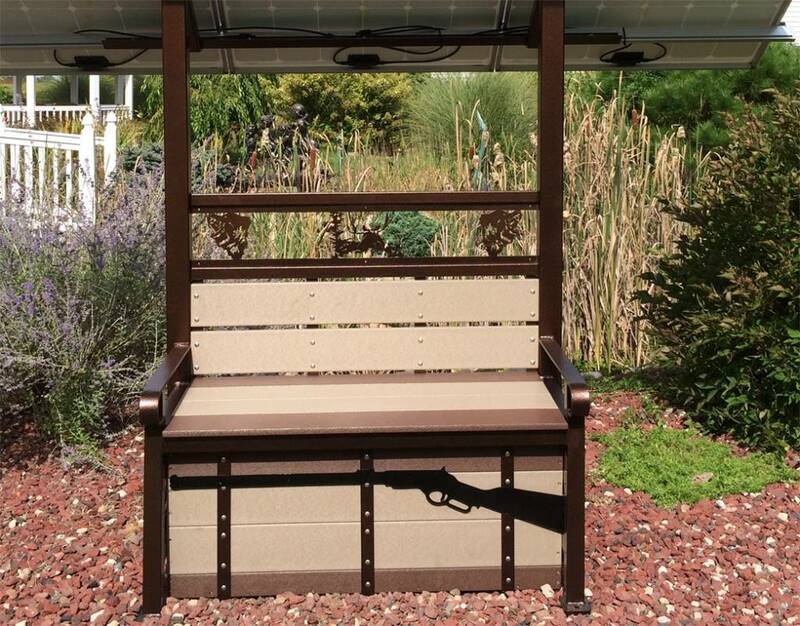 Whether in a remote location far from commercial power, or just wanting the peace of mind of being prepared for the unexpected, the Solar Bench is right for you! 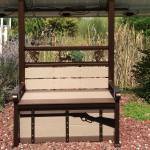 The Solar Bench is made of heavy weight powder coated steel with splinter free composite decking construction. Made with long-lasting durability in mind, it is maintenance free and comes in a choice of designs for every taste. 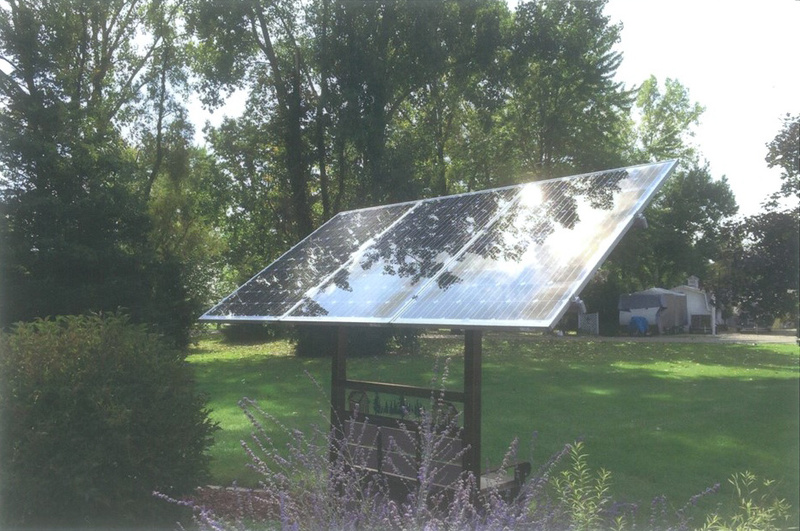 Remote Display Meter MT50 with a large backlight display enables the viewer to watch how the solar panels and batteries are performing. Dawn to Dusk Photo Control which can be used for outside lighting options of your choice. 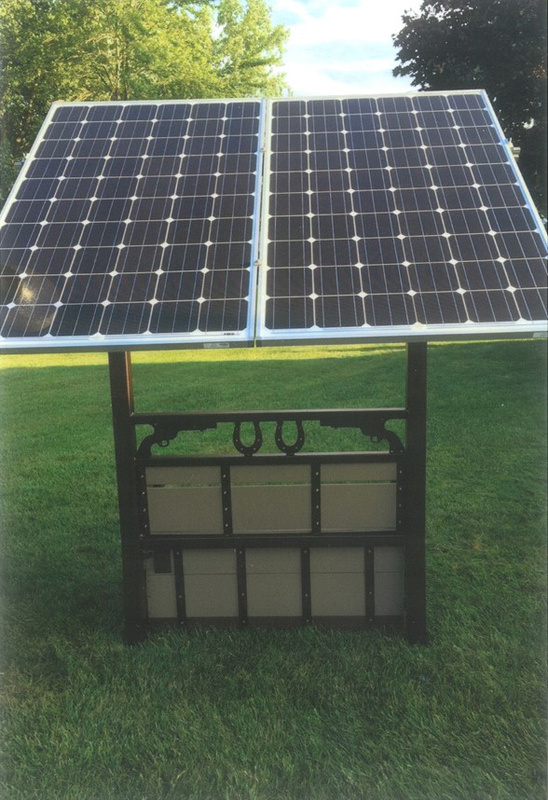 The Solar bench arrives preassembled, just mount the Solar Panel and you are ready for Power! 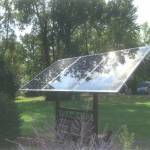 How much does the Solar Bench Weigh? 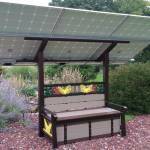 The Solar Bench, as designed, with a 3-panel array, weighs about 800 pounds. It is heavy enough to be stable in most wind conditions without having to be anchored but anchoring is advised. 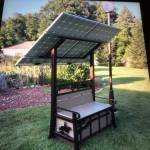 How is the Solar Bench delivered? The Solar Bench arrives at your location by common carrier truck is will be off-loaded to the ground. It will be your responsibility to move it to the final location. What is involved in assembly after arrival? All parts and directions are included in the package. Only simple hand tools are required to get the Bench operational. 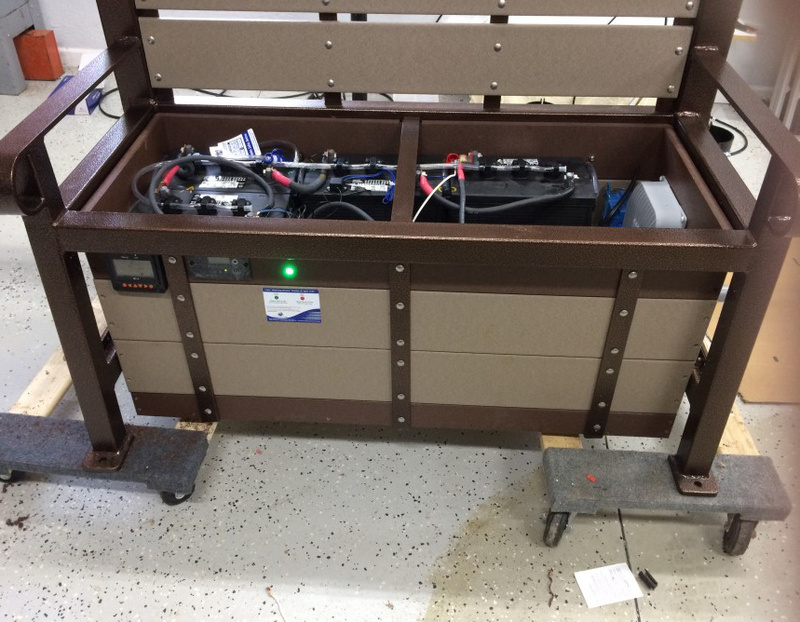 Once the Solar Bench is moved to the final locations, the mounting rails need to be mounted on the Bench frame, the panels are laid on the rails and secured. The panels are all pre-wired and the connections labeled for easy plug-in. That’s all there is to it! How much solar energy can the Bench store? 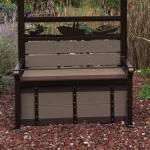 The Solar Bench has 4, liquid filled batteries stored in the seat compartment. 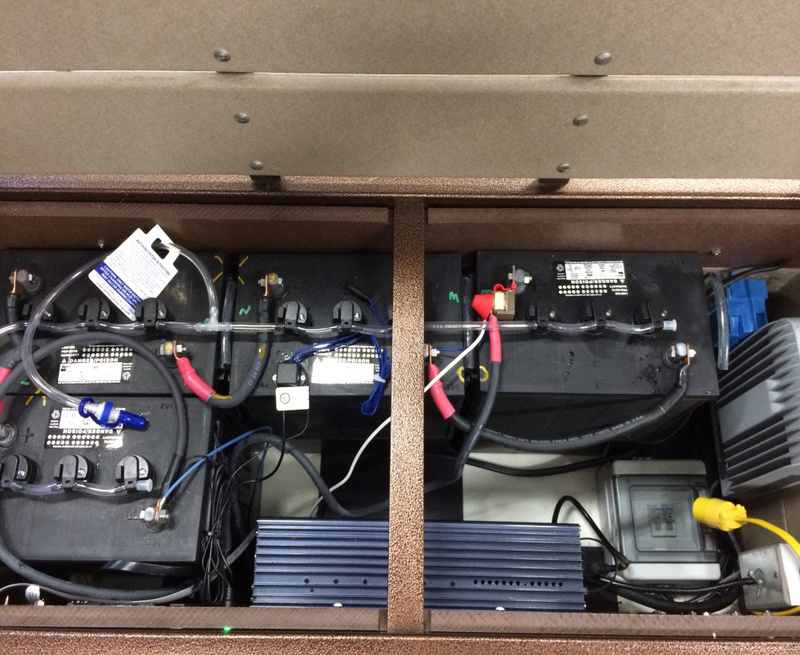 Each battery is a 285 Amp Hour. Of course, on a sunny day, they are being charged. 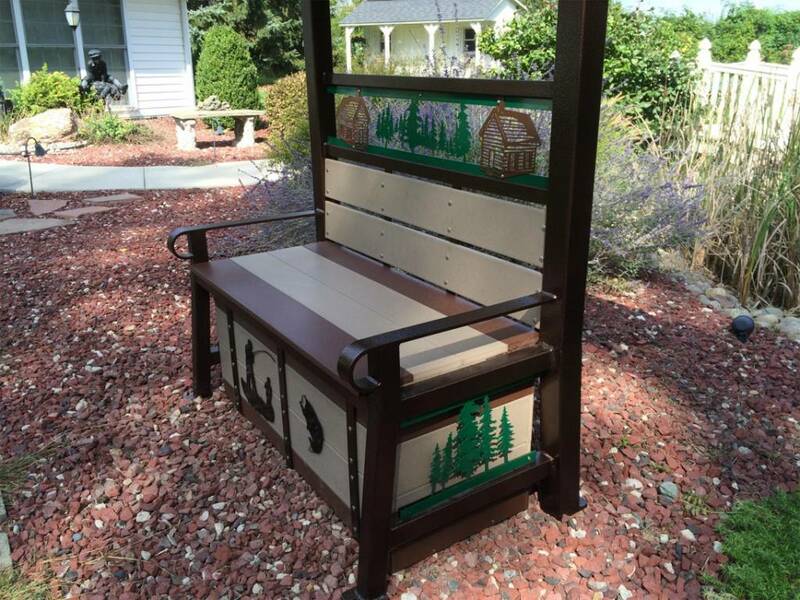 Each Bench comes with 4 storage batteries. 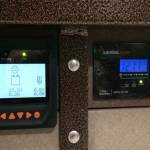 Upgrade to a Lithium Ion Battery is available. 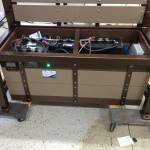 Two lithium batteries will replace the 4 batteries that are included. 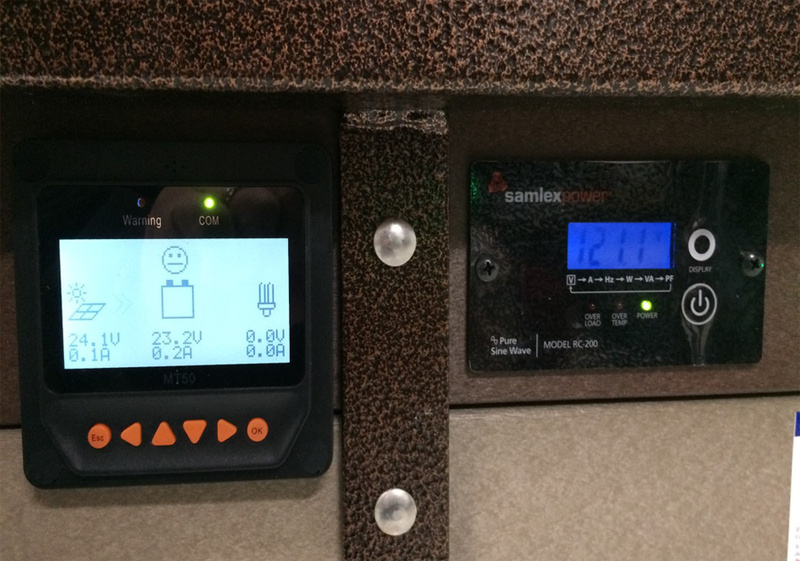 This not only reduces the weight of the bench because the batteries are very heavy, it eliminates the need for the automatic water monitoring feature of the Bench. Lithium batteries are considerably more expensive. What can I run off from the unit? 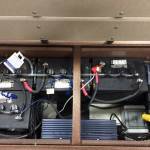 It all depends on the wattage usage of the appliances you are operating. For example, a 100-watt light bulb will operate for 20 hours. Where would I use a Solar Bench? 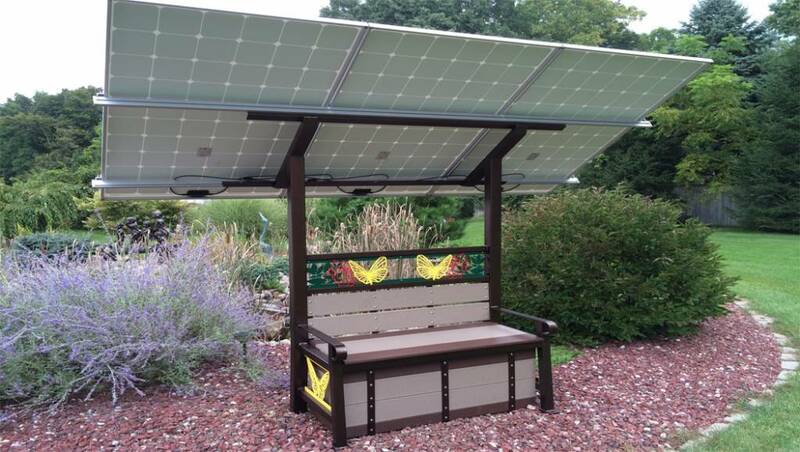 A Solar Bench is a self-contained power reserve. It could be used at a remote campsite or a bug-out cabin. 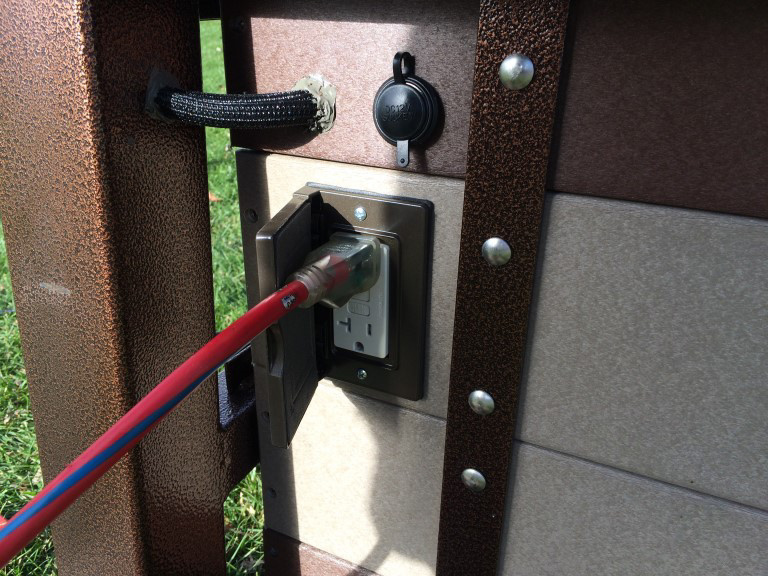 They work beautifully at a lake side where they can be used both as a bench with a sun canopy while serving as a power source for a trickle-charge for a boat starter, cell phone charger, multi-media power source or dawn to dusk lighting. Can I add to the Bench to get more power? 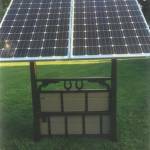 The Solar Bench is a self-contained unit sized for 2000-watt capacity. 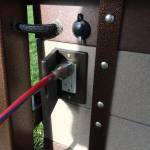 If you feel you need more power, the pole mount Time Tracker system may be more cost effective for you. 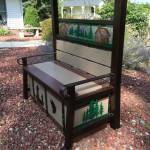 Can the Solar Bench be customized? Yes. 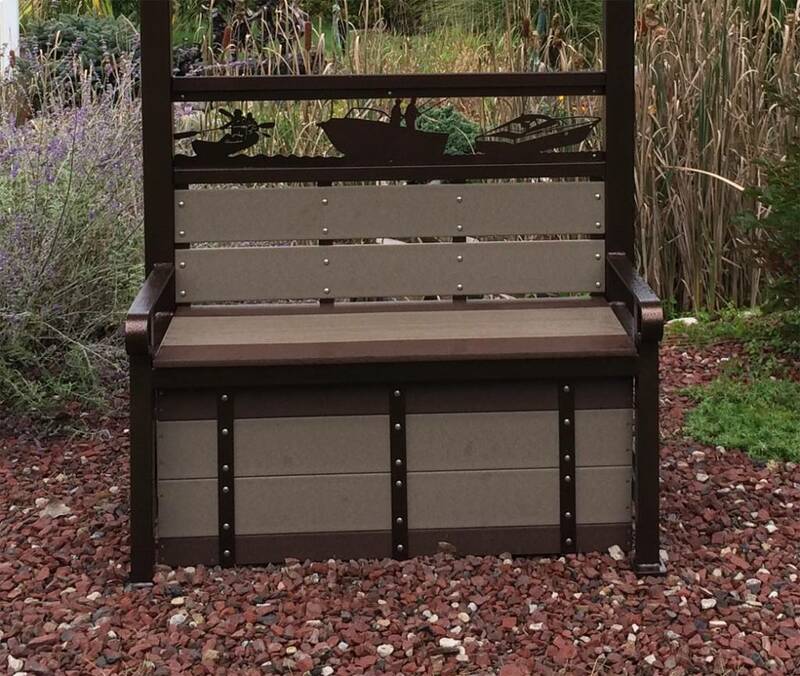 The powder-coated templates are available in many different designs and colors. We have standard designs available but will work with you to get the design that best meets your taste.